There are of course numerous petty crimes gone unreported. The once peaceful and safe haven called Singapore is going, going and gone. Less people will be walking on the streets alone from now on. 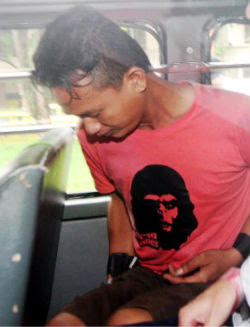 A Malaysian man from Sarawak was charged Tuesday with the murder of a construction worker in Singapore while two others were accused of gang robbery. No plea was taken from Michael Garing, 22, a general worker who allegedly committed the murder of Indian national Shanmuganathan Dillidurai, 41, with three others at an open field along Kallang Road on Sunday. In the same court, Sylvester Barogok, 26, and Shahman Milak, 21, both also from Sarawak, were charged with committing gang robbery of a mobile phone, cash of $32, a work permit card and an ez-link card from Raja Kana Kazi under an overhead bridge Friday evening. The duo were allegedly with Micheal, Hairee Landak, 19, Tony Imba, 31, and Donny Meluda, 19, one or more of whom were armed with a parang. All three were remanded at Singapore's central police division lock-up for further investigation. If convicted of murder, Micheal faces the death penalty. The maximum punishment for gang robbery is a jail term of five to 20 years and not less than 12 strokes of the cane. Beware! More foreign criminal elements are coming to Singapore! Subject: Re: Foreigners making Singapore unsafe ? the foreigners to move to Singapore. in Singapore that he saw no policemen around in sight. manning street corners - all in the name of preventing crimes. watched" in order to impress or create a safe environment. newspapers and Tv media in India and other third world countries. leaders for their crimes of it. Look at the stats, and you will find that your 'foreign talent' forefathers were guilty of far more. Stop vilifying foreigners for doing that which was a career for many of your forefathers - though not all. But I suppose its natural for a people to take racism as natural to move on to xenophobia. Pathetic mate. Real pathetic.